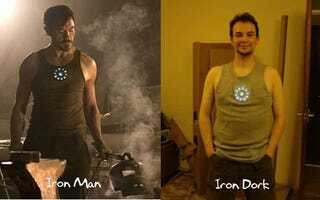 No wonder Tony Stark managed to do an arc reactor in a desert cave. According to this tutorial, you really only need some LEDs, a 9-volt battery, plywood, 22 AWG gauge copper wire, assorted resistors, and a substance called polymorph—which can be made into any shape—to create your very own virtually-unlimited power source. Or look like the geekiest homeless person at any costume party. The mask is even better.